Tom started out the year with a business trip to Las Vegas. He spent several days working in the booth shown here, and swears he didn't get into any trouble when he was there. Taken 1/9/05. Jeff kindly hosted another Super Bowl party this year on 2/6/05. Jill celebrated turning 14 with a day of laser tag with her friends. For the second year in a row, we participated in the Polar Bear Plunge to raise funds for Special Olympics. Click here to read about our day. Taken 2/26/05. Claire's bangs have long since grown out and her hair is long and beautiful. Don't think she doesn't know it! Taken 3/2/05. In March, Debbie and Tom flew to Houston for a night to attend her cousin's wedding reception. Hey, isn't there a space center in Houston? Why, yes, there is! We spent the afternoon at the visitor center and toured some of the facilities, including the original mission control room. Tom was in NASA heaven, of course. Taken 3/5/05. That evening, we headed to the Houston Museum of Natural Science for Karl and Stacia's reception. It was great to see Debbie's mother's family. The reception was held in the Cullen Hall of Gems and Minerals, which was quite fitting to celebrate the marriage of two geologists. The gems and stones on display were absolutely stunning, and made a lovely backdrop for a fun evening. Two days later, Debbie was in Chicago for a trade show. The Orchard Software booth was featuring these small squishy trucks as giveaways. Cute, huh? With Debbie's new love of gardening, we dragged the whole family out to the annual Flower and Patio Show at the Fairgrounds on 3/12/05. The flowers were pretty, but the real reason to attend was to enjoy some funnel cakes from the food vendors. The Bundy family gathered at our home for Easter. Shown here are Margaret with her children and grandchildren. After hunting for Easter eggs, the kids jumped into the spa for some fun. Taken 3/27/05. Star Wars season officially opened on 4/1/05, when the Star Wars Episode III toy collection went on sale at midnight. We stood outside for 15 minutes, waiting patiently for our chance to mob the store and buy Anakin action figures. Here is the aforementioned mob. We went home with a few more action figures to add to our set. We say that we keep them around for when little kids come to visit. We lie. Jill spent Spring Break in Sarasota, Florida with her friend Jackie's family. Here's the beach in front of their condo. Star Wars season kicked into high gear in late April, when Star Wars Celebration III rolled into town. Read all about our adventures here. Debbie's coworkers enjoyed a few beverages after work to celebrate the latest release of our software in May. Since it was still Star Wars season, Jeff favored us with his best "Wookiee Rage" impression. Taken 5/2/05. This doesn't look like a birthday celebration, but we spent the Tom's mother's birthday working on her yard with his two brothers. Any opportunity to do some gardening is a party to us! We were back at Jeff's again for the Survivor 10 finale, which was the first one ever not hosted by us. Of course, we had to bring along our Survivor buffs and shot glasses, because it's just not a Survivor finale party without those. Taken 5/15/05. Finally! Just before midnight on 5/18/05, we found ourselves in the parking lot of the Menard's next to our local movie theater, because it was the closest parking we could find for the premiere of Star Wars Episode III. Twelve hours later, we were able to find closer parking when we attended again with Debbie's coworkers on their annual movie outing. Debbie's parents stopped by for a weekend on their migration from their winter home in Arizona to their summer home in northern Minnesota. We spent an afternoon at the White River State Park near downtown Indy. Taken 5/21/05. Indy is a racing town, and we do love the Indy 500. Read all about our 2005 trip to the race track here. Taken 5/29/05. We had some spooky weather in early June, and the clouds were so interesting that we had to get a photo. Debbie's hopes of seeing a real, live tornado were dashed when this combination of clouds didn't produce a funnel. Taken 6/5/05. In June, we visited Greenland and Iceland. Greenland was spectacularly beautiful and cold. We stayed in Iceland, but took a day trip to Kulusuk, Greenland, shown here. Taken 6/13/05. Iceland was also gorgeous, and we really enjoyed our time there. This photo is of the waterfall Gullfoss, one of the sights along the Golden Circle in southeast Iceland. Read all about our trip here. Back in Indy, we spent Tom's birthday with Claire in Lafayette, visiting their frog statues scattered throughout the downtown area. Next, we crossed the river to West Lafayette and did some sightseeing on the Purdue campus. ... and the not-traditional-but-always-fun taste test of unusual Russian beverages, both alcoholic and non. Taken 7/6/05. Another poker night at Stephanne's, another Bundling in a showdown for first place. This time, it was Tom's turn to take second place. The very next day, Tom's colleagues gathered for a day of Track Attack fun, featuring SPEC racing cars. Debbie, Tom, and Fran's husband, Rick were assigned to a team, and we had a blast. Taken 7/9/05. Claire turned sixteen in July, and celebrated with some new electronic toys from Grandma Bundy. ... and here are the party guests. Jill and Debbie attended a Pampered Chef fundraiser for Special Olympics in August, where we got to see adorable Turner and Quincy. Jill helped them do a little coloring, even though Quincy could barely reach the table. Tom, Debbie, and Jill took a day trip to Yellowstone and the Grand Tetons on 9/4/05. Of course, we got to see Old Faithful erupt, but we got to see so much more in our whirlwind three-state tour. The very next day, we had a belated birthday celebration for our friend Brent, where we mixed up some very colorful fruity champagne concoctions. 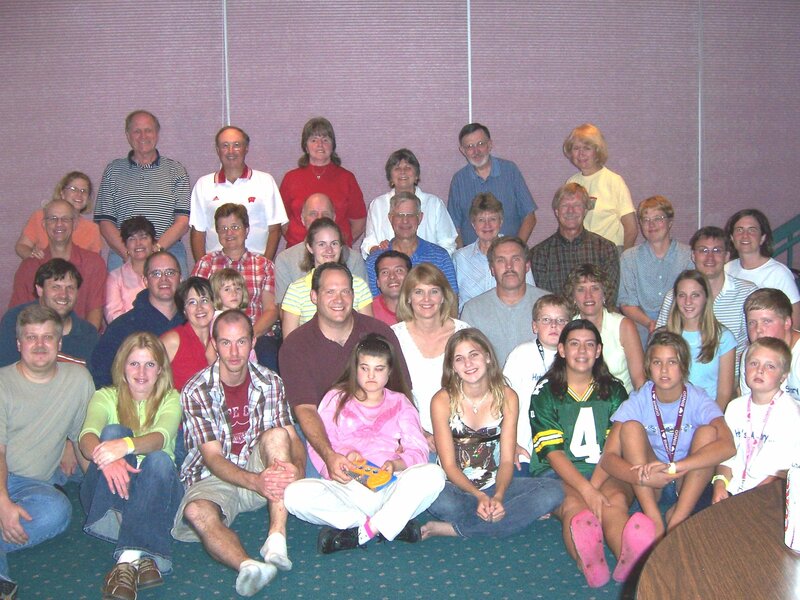 Every two years, we journey to the Wisconsin Dells for the biannual Schilling Reunion. This three day extravaganza involves eating, drinking, playing games, doing puzzles, and general catching up. ... and here's Jill shooting water at you. Taken the weekend of 9/9/05. The next weekend, Jill and her friends attended the homecoming dance at Carmel High School. Here's a great closeup of Jill, wouldn't you agree? Taken 9/17/05 by Rich Phelan. In early October, we dashed up to Minnesota for the weekend to attend Debbie's cousin's wedding. Jill got this cool shot while we enjoyed the beautiful weather in front of the church just after the ceremony. Taken 10/1/05. Our little cousin, Renee, was a beautiful flower girl. Melissa and Erik cut the traditional wedding cake, but we also were treated to a Norwegian wedding cake which was in keeping with the Norwegian theme for the entire day. ... then Doug and Tom posed for a photo in the pool back at the hotel afterward. The post-reception activities at the hotel also included eating a buffet dinner, opening wedding presents, and playing a cutthroat game of Guillotine. The next day, we spent some time at the Mall of America. Even though we've been there before, we still have to marvel at the size of the amusement park within the mall. Our last stop before leaving town was Carbone's Pizza on Randolph Avenue. Under the current awning/sign, the old sign that we grew up with is still visible. We took a few frozen Carbone's Specials home with us, because it is the most delicious pizza in the universe. Taken 10/2/05. Fall in Indiana brings corn mazes. It's hard to believe, but this was our fourth year of corn mazing. Click here for full details about Maize Maze Mayhem IV. Taken 10/8/05. The annual 4D Summit was held in San Francisco October 11 - 15, 2005, and this year, Tom joined Debbie for the week. Much information was learned, much fun was had, and most importantly, many photos were taken. On the same trip, we had dinner with Debbie's friend, Marcel, last seen in 1996 and 1986. Claire participated in MATP at the Special Olympics Fall Classic on 10/22/05. We documented it all, included Claire's delight at hearing the names announced over the loudspeaker. Among all the other traveling we did this fall, Tom went to San Diego on business in September, October, and November. On his third trip, he took an extra day to do a little sightseeing, including a visit to the San Diego Maritime Museum. Here is the HMS Surprise, used in the movie "Master and Commander." Taken 11/5/05. While Tom was taking in the San Diego sun, Debbie and Gina were at the Arthur Murray studio, watching Audrey and Brent dance, before heading to Nancy's birthday party immediately afterward. Also taken 11/5/05. The theme for this year's Special Olympics Hamilton County annual danceathon fundraiser was Mardi Gras, so all four of us, plus Jill's friend Jackie, put on our finest baubles. We had a great time but we forgot our camera, so we got this shot when we got home. Taken 11/11/05. We added another continent to our list when we visited Rio de Janeiro over Thanksgiving. We had six days in Rio and filled our days with great experiences. This photo of Copacabana Beach was taken from our hotel room on 11/27/05. This photo is of Sugarloaf Mountain, taken from Corcovado on 11/29/05. Read all about our trip to Brazil here. We got all dressed up for Tom's company holiday dinner at Eddie Merlot's on 12/3/05. In addition to our finery, we were sporting our Rio suntans. A mere ten days after returning from Brazil, we were off to warmer climates again. To celebrate our friend Gina's 40th birthday, the Vegas Five took a cruise to the Bahamas in December. Here we are about to embark on our three day cruise. Taken 12/9/05. Back in the land of the cold, Debbie celebrated her birthday with presents and German chocolate cake after returning home from a business dinner with clients. Taken 12/13/05. On Christmas Eve, we got this lovely photo of our girls in front of our Christmas tree. Finally, we celebrated New Year's Eve a night early with a New Year's Penultimate Eve Party at the Blackwells' home.